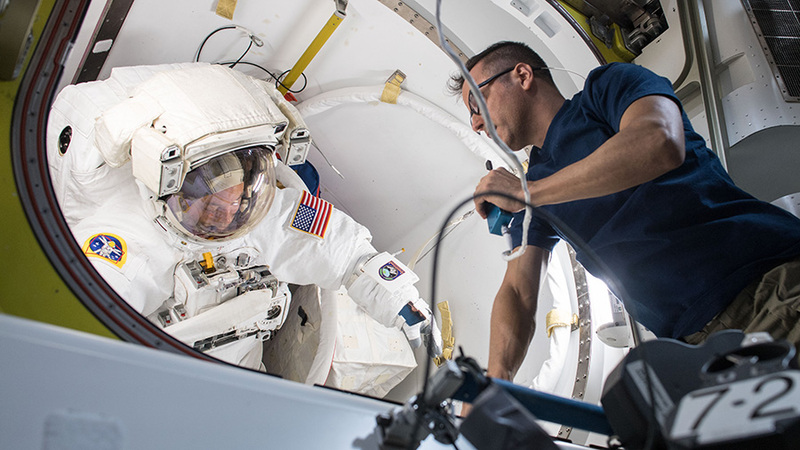 Astronaut Scott Tingle works on a U.S. spacesuit inside the Quest airlock at the beginning of January 2018 before a pair of robotics maintenance spacewalks were scheduled to begin. International Space Station managers have rescheduled a U.S. spacewalk postponed on Monday to mid-February. Meanwhile, the Expedition 54 crew is also preparing for a Russian spacewalk this Friday. Astronauts Mark Vande Hei and Norishige Kanai are planning to begin their spacewalk Feb. 15 at 7:10 a.m. EST to stow and reposition a pair of Latching End Effectors (LEEs). The LEEs are robotic hands attached to the tip of the Canadarm2 that grapple and release cargo ships and external station hardware. During the 6.5-hour excursion, the spacewalkers will first move an older LEE from a bracket on the Mobile Base System on the truss to the Quest airlock. It was removed from Canadarm2 during a spacewalk last October. Next, a degraded LEE detached from Canadarm2 during the last U.S. spacewalk on Jan. 23 will be moved from an external stowage platform to the Mobile Base System. NASA TV will begin its live broadcast of the spacewalk at 5:30 a.m.
Cosmonauts Alexander Misurkin and Anton Shkaplerov will exit the Pirs airlock in their Orlan spacesuits Friday at around 10:30 a.m. for 6.5 hours of Russian maintenance, highlighted by the swap out of an electronics system for the Zvezda Service Module’s high gain communications antenna. Live NASA TV coverage begins at 9:45 a.m. Earlier today, Zvezda’s engines fired for 23 seconds to increase the station’s altitude and set up operations for the arrival of cargo and the departure of crew. The Progress 69 cargo craft will launch from the Baikonur Cosmodrome in Kazakhstan Feb. 11, then 3 Expedition 54 crew members will depart the station in their Soyuz MS-06 spacecraft Feb. 27 for a landing in Kazakhstan later that day. Cosmonauts Anton Shkaplerov (left) and Alexander Misurkin work inside the U.S. Destiny laboratory module participating in eye exams using a fundoscope. 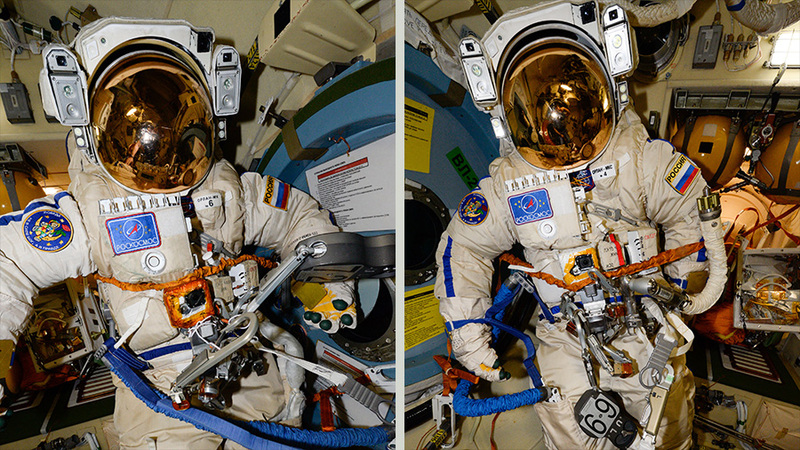 Cosmonauts Alexander Misurkin and Anton Shkaplerov will put on their Orlan spacesuits Friday and exit the Pirs airlock around 10:30 a.m. EST. The duo will be spacewalking for about six and a half hours to replace an electronics box for a communications antenna on the aft end of the Zvezda service module. The old box will be jettisoned into space to eventually burn up in the Earth’s atmosphere. If time allows, the Russian spacewalkers may be able work a few more tasks. A pair of exposed experiments, Test and Biorisk, are due to be retrieved and brought back inside the station. The cosmonauts may also photograph the back of Zvezda, reposition a foot restraint and jettison old experiment gear. Over the weekend space station managers postponed today’s spacewalk for robotics maintenance. Astronauts Mark Vande Hei and Norishige Kanai were expected to swap a Latching End Effector (LEE) on the tip of the Canadarm2 today installed last week on a spacewalk; however, Canadian Space Agency engineers uploaded a diagnostics software to identify the primary communications string anomaly and test the software upgrade on the spare LEE, eliminating today’s swap work. The final software patch will be uploaded in early February. The duo is now planning for a mid-February spacewalk to bring an end effector inside the station removed from the arm during a spacewalk last October, and install the end effector removed last Tuesday on the mobile base system rail car on the station’s truss. Astronaut Norishige Kanai of the Japan Aerospace Exploration Agency tries on a pair of spacesuit sleeves inside the Quest airlock. To either side of Kanai are the U.S. spacesuits that were being readied for a pair of robotics maintenance spacewalks. During its initial power up after last Tuesday’s spacewalk swap, the spare latching end effector did not communicate as expected on the primary string, but did so on its backup communications string. As a result, Monday’s spacewalk by Mark Vande Hei of NASA and Norishige Kanai of the Japan Aerospace Exploration Agency (JAXA) was replanned to return the original latching end effector to the arm in place of the spare. But the software solution confirmed on Saturday will not require the spacewalkers to venture out on Monday. NASA astronaut Mark Vande Hei photographed himself with his helmet visor up during a spacewalk that took place on Jan. 23, 2018. During a spacewalk on Jan. 23, 2018, Expedition 54 flight engineers Mark Vande Hei and Scott Tingle replaced a Latching End Effector (LEE-B) on the Canadarm2 robotic arm. An issue preventing the LEE from transitioning to an operational state on one of two redundant sets of communications strings was detected. The spacewalking crew demated and remated the connectors and ground teams were able to power up the arm to an operational state on its secondary communications string leaving the arm operational but without a redundant communications string. After extensive troubleshooting by teams from NASA and the Canadian Space Agency (CSA), the decision was made by space station managers to use the scheduled Jan. 29 spacewalk to reinstall the LEE removed on the Jan. 23 spacewalk to restore fully redundant capability to the robotic arm. CSA and its robotics specialists are continuing diagnostics over the weekend to gain additional insight. If data is obtained that could be used to solve the issue, Monday’s spacewalk could be postponed. 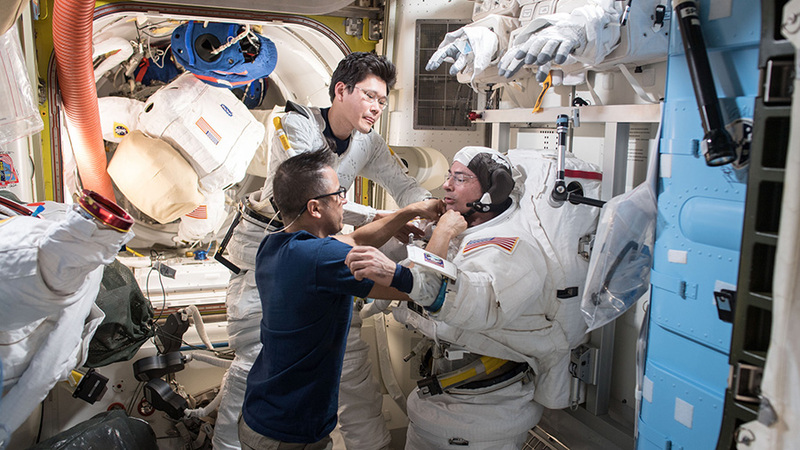 Astronaut Joe Acaba (clockwise from bottom) assists spacewalkers Norishige Kanai, from the Japan Aerospace Exploration, and Mark Vande Hei, from NASA, during a fit check of their U.S. spacesuits. Kanai and Vande Hei will conduct a spacewalk Jan. 29 wrapping up work on a Latching End Effector from the Canadarm2. Two Expedition 54 astronauts continue preparing for Monday’s upcoming spacewalk to wrap up robotics repair work. The crew is also working on a variety of science gear to ensure the orbital laboratory is in tip-top shape. Flight Engineer Mark Vande Hei is going outside the International Space Station again for this year’s second spacewalk. This time he’ll work with Japanese astronaut Norishige Kanai to finish maintenance on a Latching End Effector, or the robotic hand of the Canadarm2 robotic arm. That work was started Tuesday when Vande Hei partnered with NASA astronaut Scott Tingle during a seven-hour and 24-minute spacewalk. Monday’s spacewalk begins at 7:10 a.m. EST with live NASA TV coverage beginning at 5:30 a.m.
As usual, advanced microgravity research is ongoing inside and outside the space station. 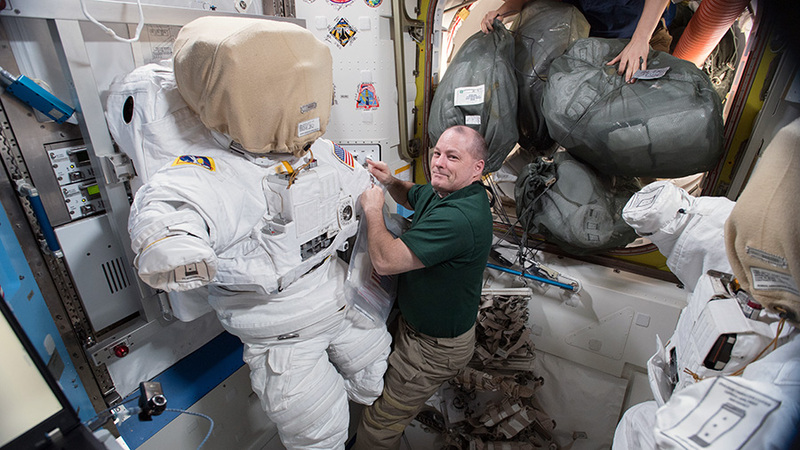 This morning, veteran station astronaut Joe Acaba tended to a pair of science freezers ensuring they maintain proper temperatures for the stowage of biological samples. Kanai checked out a 3D printed satellite deployer that will spring-launch four tiny satellites known as FemtoSats from the station. 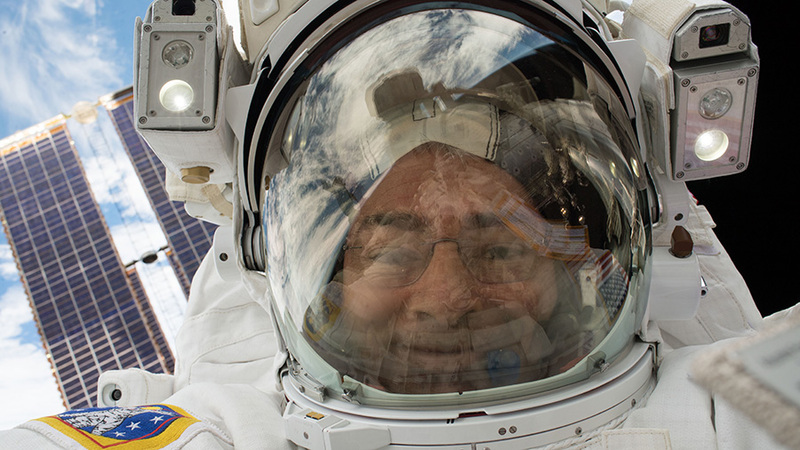 One spacewalk down, two more to go before next weekend. A U.S. and a Japanese astronaut will go on the next spacewalk Jan. 29 followed by two cosmonauts on Feb. 2. Flight Engineers Mark Vande Hei and Norishige Kanai will put on their U.S. spacesuits early next week and exit the Quest airlock to wrap up maintenance on the Canadarm2. The duo will spend about six and a half hours wrapping up work from Tuesday’s spacewalk on swapping a degraded Latching End Effector from the Canadarm2. The spacewalkers will start their excursion Monday at 7:10 a.m. EST and NASA TV coverage will begin at 5:30 a.m.
Cosmonauts Anton Shkaplerov and Alexander Misurkin are also preparing for their next spacewalk set for next Friday when they open the Pirs docking compartment hatch at 10:34 a.m. The veteran station residents will don their Russian Orlan spacesuits for a near six-and-a-half-hour spacewalk outside the International Space Station’s Russian segment. The duo will retrieve science samples exposed to outer space and install a high gain antenna on the rear of the Zvezda service module. NASA TV coverage starts 9:45 a.m. Both excursions come in the wake of Tuesday’s spacewalk with astronauts Vande Hei and Scott Tingle lasting seven hours and 24 minutes. The two astronauts replaced a Latching End Effector (LEE) on the station’s robotic arm, Canadarm2. In the midst of the busy spacewalk work, the Expedition 54 crew has been conducting science to understand how living in space affects the human body. Vande Hei is exploring how station lighting affects crew sleep while astronaut Scott Tingle looked at microgravity’s impacts on the brain. Flight Engineer Joe Acaba explored using a special strain of bacteria to support long-term life support systems on future spacecraft. Astronaut Joe Acaba (left) assists astronaut Scott Tingle during a fit check in his U.S. spacesuit. 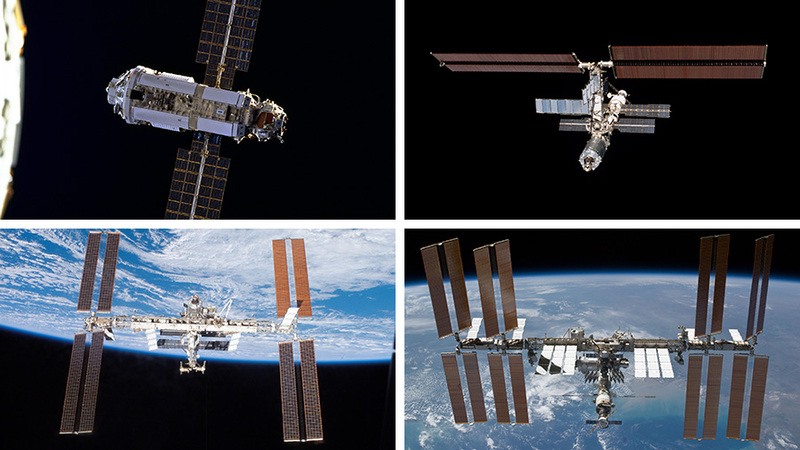 Clockwise from top left: The first station module, Zarya from Russia, is pictured December 1998 from Space Shuttle Endeavour; the first station crew, Expedition 1, was onboard the station in February of 2001; a growing station was pictured in June of 2007; the station in its near final configuration in February 2010. The International Space Station has been orbiting Earth for 7,000 days as of today Friday, Jan. 19, 2018. The first module, the Russian Zarya cargo module, launched to space in November of 1998. The first crew arrived at the young three-module orbital laboratory in November of 2000. 54 crews and 205 spacewalks later, the current six-member Expedition 54 crew is gearing up for a pair of spacewalks on Jan. 23 and 29. NASA astronaut Mark Vande Hei will lead both spacewalks with Flight Engineer Scott Tingle joining him on the first spacewalk. 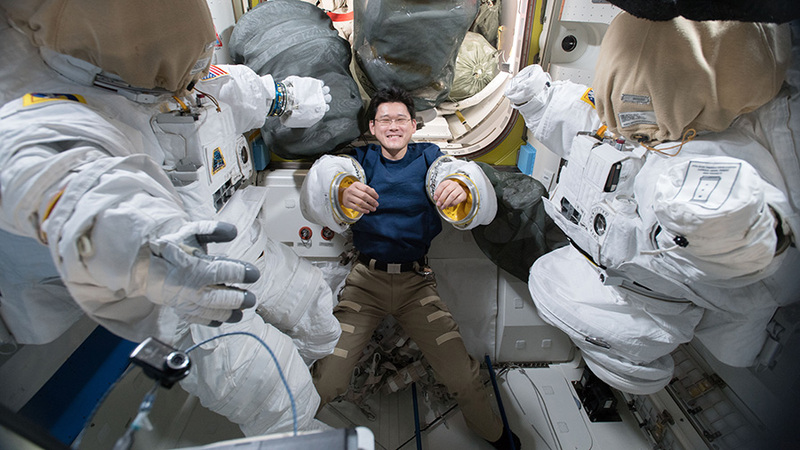 Japanese astronaut Norishige Kanai will join Vande Hei for the second spacewalk. All three astronauts were joined today by Flight Engineer Acaba for a spacewalk procedures review with specialists on the ground. The spacewalking trio will be swapping and stowing robotics parts to maintain the upkeep of the Canadarm2 robotic arm. 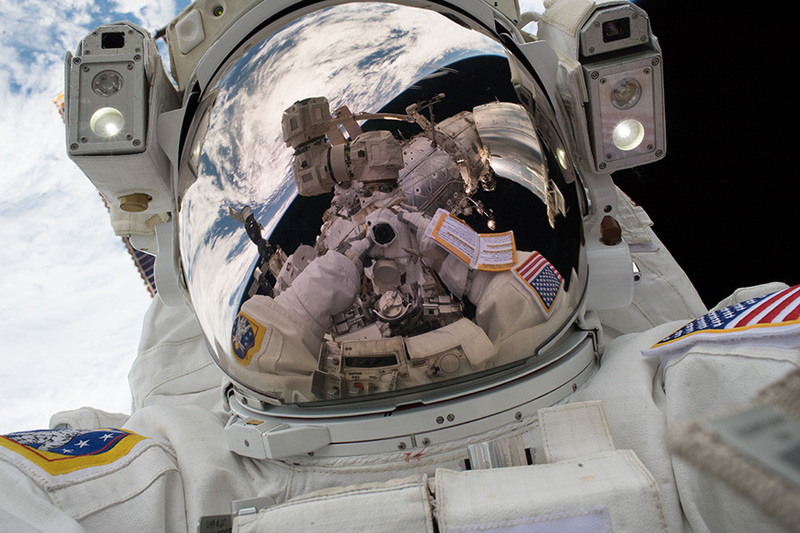 Both spacewalks will start each day at 7:10 a.m. EST with live NASA Television coverage beginning at 5:30 a.m. The two cosmonauts aboard the space station, Commander Alexander Misurkin and Flight Engineer Anton Shkaplerov, conducted regularly scheduled eye checks today. The veteran orbital residents worked with doctors on the ground using a fundoscope to view the interior of the eye. 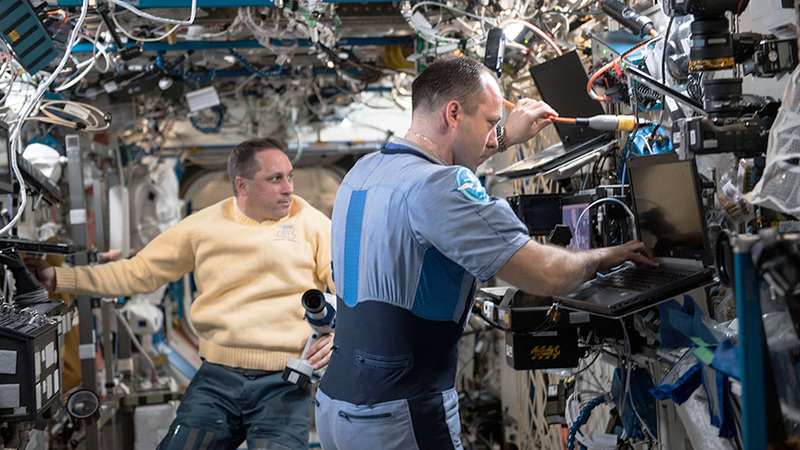 Crew members aboard the station participate in regular eye exams to understand how living in space affects vision. NASA astronauts Scott Tingle (left) and Mark Vande Hei, seen here in the Destiny laboratory module, will participate in the Jan. 23 spacewalk. 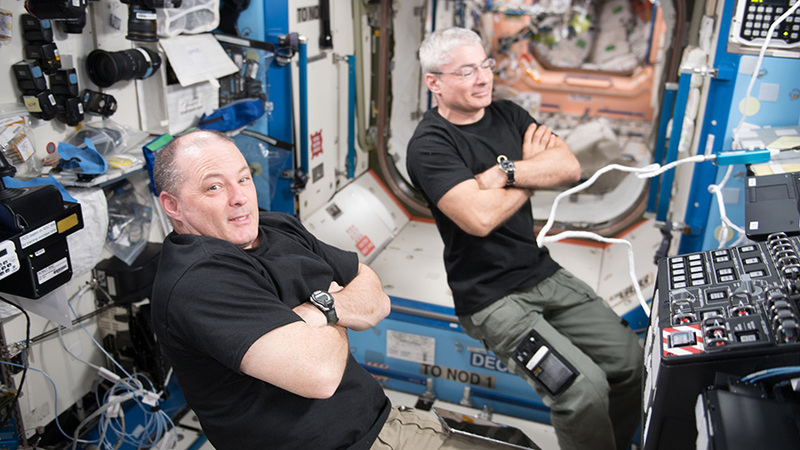 A pair of spacewalks are planned for Jan. 23 and 29 to swap and stow external robotics gear. NASA astronaut Mark Vande Hei will lead both spacewalks. Flight Engineer Scott Tingle will join him on the first spacewalk with Japanese astronaut Norishige Kanai joining Vande Hei on the second. Vande Hei, Tingle and Kanai checked the spacesuits today they will wear outside the International Space Station for the two robotics maintenance spacewalks. Flight Engineer Joe Acaba assisted the spacewalkers with their spacesuit fit checks and helped collect spacewalk tools.